Sony’s newly announced PS Vita TV device won’t be launching in North America or Europe at the same time as it’s Japanese release, which is currently scheduled for release on November 14th 2013. Shuhei Yoshida, President of Sony’s Worldwide Studios, has taken to twitter to confirm that the device will first release in Japan, before heading to the West at a later stage. The news comes from a press round table interview hosted by Andrew House, as reported by TechOn. In the interview, House also confirmed that PS3 games will be playable on the device using cloud-based game distribution (presumably Gaikai) in the future. “In the future, SCE will offer games developed for the PS3 to PS4 and PS3 by using a cloud-based game distribution service. Technically, the PS Vita TV can support such games. 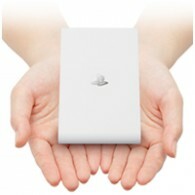 Therefore, SCE is considering providing PS3 games to the PS Vita TV by using the service in the future,” says house.